Social enterprise, as a field of study, has provoked scholarly engagement ranging from spontaneous celebration to critical engagement. However we lack a deep understanding of how the optimistic and politically powerful, yet ambiguous and elusive ideal is lived in social practice. Ethnography, ethnomethodology and workplace studies offer the methodological potential to carve out local experimental practices of social-problem solving, and to capture the ways managers, staff and/or target groups reflect on their engagement in entrepreneurial activities. Such insights are essential for (1) developing multilayered, contextualised views on social enterprise (2) understanding the temporal, spatial and cultural dynamics of social entrepreneurship, and (3) taking sufficient account of the effects of social entrepreneurial policies on vulnerable target groups. Ethnography also offers the potential to move the debate around social enterprise beyond idealized concepts and managerial views. Since emerging from the field of Anthropology, ethnography has been employed to study, in particular, the social realms of colonized, deprived, and marginalized groups of people. It has proven analytical strength in unraveling the contradictory, paradoxical aspects of human practice and the subtle workings of power. Social enterprise – as an organizational form comprising competing logics of social inclusion and management practice – demands an appropriate set of methods that makes room for complexity and counter-discourse, that considers social enterprise within its wider (political) context, and that attends to the longitudinal and spatial dimensions of organizational behavior which, to date, have been neglected in much of the academic literature. Potential questions which might be studied from an ethnographic perspective include: What are the long-term effects of social entrepreneurial practices? How do organizational actors sustain their social values in times of economic pressure? Which hopes and expectations motivate clients to participate in social entrepreneurial projects and how do they experience “personal improvement”? Under what circumstances do these initiatives fail or succeed? In the second annual workshop to explore the use of ethnographic methods within social enterprise research we are interested in methodological and empirical work pursuing an ethnographic approach to social enterprise. We welcome methodological reflections and empirical contributions in the form of a single case study, a multi-sited ethnographic framework, or an auto-ethnography of being a social enterprise practitioner. Of particular interest, and stemming from discussion in the initial workshop, is work that seeks to explore the ways that the current political discourse of social enterprise is used and interpreted, challenged or supported by actors within the sector. The Health Experiences Research Group, within the Nuffield Department of Primary Care Health Sciences, is seeking a postdoctoral ethnographer to join the internationally regarded HERG team. This excellent opportunity has arisen through funding for an NIHR HS&DR funded project. The INQUIRE study aims to improve NHS capability to interpret online feedback from patients and the public, and to understand whether and how to act on this to improve services. INQUIRE is comprised of five projects; this post involves being part of a project which will capture how NHS staff, and the organisations they work for, use (and resist using) user-generated online content in practice. The postholder will be responsible for conducting in-depth organisational case studies in four NHS Trusts across the UK and will be embedded in each of the four sites for a period of time in order to study individual and organisational-level issues in relation to online patient feedback on health services. You will hold a PhD in a social science or possess equivalent research experience, have proven experience of ethnographic research, preferably with experience relevant to technology adoption in a health care setting, with excellent interpersonal, analytic and communication skills, a strong publication record and an interest in digital healthcare. The post is available full-time, fixed-term, for 2 years. The closing date for applications is 12.00 noon on Wednesday 9 September 2015. We plan to hold interviews on Wednesday 23 September or Tuesday 29 September 2015 (date to be confirmed). Embedded in the quest for ways to preserve and promote heritage of any kind is an appreciation or a sense of an impending loss of a particular way of life – knowledge, skills set, traditions — deemed vital to the survival of a culture. Foodways places the production, procurement, preparation and sharing or consumption of food at an intersection among culture, tradition, and history. Thus, foodways is an important material and symbolic marker of identity, race and ethnicity, gender, class, ideology and social relations. Urban Foodways and Communication seeks to enrich our understanding of unique foodways in urban settings around the world as forms of intangible cultural heritage. Each ethnographic case study is expected to focus its analysis on how the featured foodways manifests itself symbolically through and in communication. The proposed volume aims to help advance our knowledge of urban food heritages in order to contribute to their appreciation, preservation, and promotion. We invite chapter proposals from scholars from all geographic and cultural regions of the world, and are particularly interested in attracting scholars from diverse disciplinary backgrounds to write ethnographic case studies of distinctly identifiable foodways that they consider worthy of examination as intangible cultural heritage. All submissions must include two documents, a Chapter Proposal and a separate CV of no more than three pages. The Chapter Proposal must contain (a) a working title of the proposed chapter, (b) an 800 to 1,000-word exposition consisting of a clear description of the proposed ethnographic case study and a concise statement on how and why the foodways being examined can be regarded as a form of intangible cultural heritage, and (c) a one to two-page annotated outline of the proposed chapter. Please do not identify yourself in any way in the Chapter Proposal. Include in your submission a separate CV of no more than three pages. All submissions will go through a referee process by a review committee established in conjunction with the UNESCO Chair Project on Safeguarding and Promoting Cultural Food Heritage at the University of Tours, France. All submissions must be written in English and prepared in accordance with the style of the sixth edition of the American Psychological Association (APA) Publication Manual. Please submit your documents in the MS Word file format. Each complete chapter manuscript must be between 5,000 and (no more than) 5,500 words, inclusive of the main text and References. The use of the 12-point Times New Roman font in MS Word is preferred. 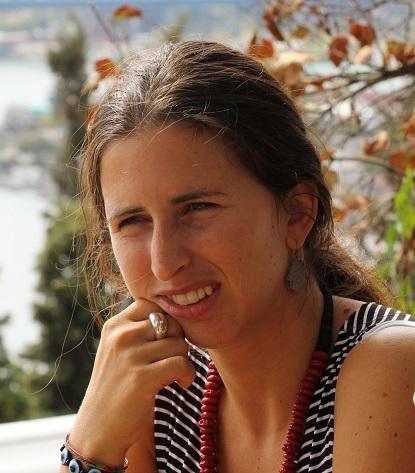 Federica Setti holds a PhD in Anthropology and Education at the University of Turin. As part of her PhD she has carried out an ethnographic study of education and relationships between Roma and non-Roma among a Sinti family network and in a middle school attended by their teenager children in Trento. She was visiting scholar at the University of Edinburgh, based at STEP (Scottish Traveller Education Programme). She carried out ethnographic research among a Dassikané Roma family network and in a primary school attended by their children in Turin as part of her MA in Cultural Anthropology and Ethnology. Her research interests include Romani studies; Cultural and Medical Anthropology; Migration studies and Anthropology of Death. She carried out ethnographic research into Moroccan peoples’ migration experiences between Italy and Morocco and an ethnography of mourning processes, related to relatives of patients attended by a palliative care centre in Trento, for her BA degree in Cultural Anthropology and Ethnology. The latter is published in the The Italian Journal of Palliative Care under the title “Processes of Mourning: Ethnography and Life histories in Trentino.” She also concentrated on the history of relationships between majority societies and minorities, particularly through an archival research on the special classes ‘Lacio Drom’ activated in Italy only for those called ‘Gypsies’, with an exonym, published in the article “‘You, Gadže, see school in one way. We, Sinti, see it in another way’: An ethnography of education and school pathways of Sinti and non-Sinti in Trento,” in Trentino’s Archive Journal. The monograph about her PhD research, titled “In A Matter of Perspectives: Ethnography of Education and of Relationships between Roma and non-Roma” is in publication, in Italian, with the publisher CISU (Rome). Furthermore, the journal articles she wrote related to her PhD ethnography are forthcoming, including “The implications of ‘naming’ on Roma and Sinti right to education and social inclusion: an ethnography of education among a Sinti family network,” prepared for the Special Issue “On the education of Roma, Travelers and ‘occupational nomads’. Research findings and questions that interrogate researchers and educators,” to be published in Intercultural Education Journal. She was Teaching Fellow, Lecturer and Exam committee member in Anthropology of Education, Intercultural Education and Educational Processes in Multicultural Societies (chair: Professor Francesca Gobbo) at the University of Turin, for four years. She is in the Teachers of Italian as Foreign language’s Province of Trento’s register and taught for three years Italian as foreign language to migrant and Roma students in middle schools. She is a member of the European Academic Network on Romani Studies, the Gypsy Lore Society and the URBA-ROM Network. She is also co-founder and member of wom.an.ed – women’s studies in anthropology and/of education. She is reachable via email. Researching professional discourse is an exciting multi-faceted enterprise, from gaining access and collecting data to feeding these results back in the form of recommendations to practitioners. This two-day symposium invites contributions which explore these two extreme ends of the scholarly process , investigating written, oral, non-verbal and digital communication in professional settings as both input and output or: the “ins and outs” of business discourse research. Day One – 6 March: THE INS (Dipartimento di Studi Linguistici e Culturali – Modena) focuses on issues of access and data collection: how can we convince practitioners to let us observe, record, interview, survey etc? And what counts as data? How much do we need ? In what shape and form? And how does our research interfere with what we study? Day Two – 7 March: THE OUTS (Dipartimento di Comunicazione ed Economia – Reggio Emilia) looks at how results can be fed back to the field in the form of recommendations: how can business discourse research be applied to help shape practice? How do we translate our methods and concepts for the communities that we investigate, including industry, government and non – profit organizations? The symposium offers an all-plenary format, with ample time for discussion. On both days we welcome data- and case-based, empirical talks, presenting best practices, self-reflections or meta-analyses, drawing on a wide range of qualitative, quantitative and critical perspectives on professional and business discourse, from ethnography, corpus studies and sociolinguistics to interaction analysis, genre studies and document design. On April 15, 2013 I gave a talk entitled: “Asking cultural questions: Using ethnography to answer questions about cultural identity” for the Department of Communication at the University of Macau. The topic and case studies provided were related to my research. 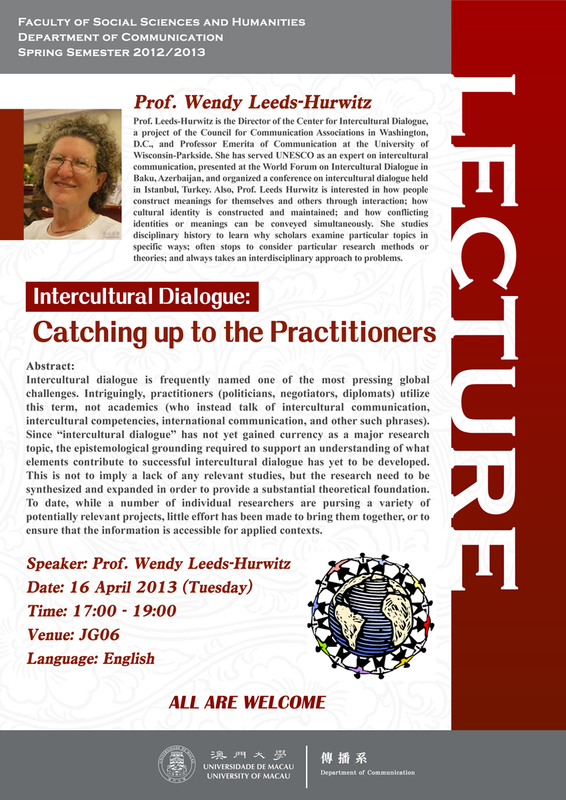 On April 16, 2013, I gave another talk in the Department, entitled “Intercultural dialogue: Catching up to the practitioners.” This talk was related to the Center for Intercultural Dialogue. My thanks to Dr. Todd Sandel for organizing these events, and for all the time spent showing me around Macau, and to his students and colleagues for providing such a good audience, and asking provocative questions. While at the University of Macau, I had the opportunity to connect with Dr. Martin Montgomery (Chair Professor and Head of Department), Dr. Timothy Simpson (Associate Dean, Faculty of Social Sciences and Humanities), Dr. TAN See Kam, Dr. Annie YANG, Dr. Ozge GIRIT, Dr. Mike Chinoy, and Dr. Andrew Moody. As Dr. Ingrid Piller (at Macquarie University in Australia) also happened to be present to give a talk of her own, I also was able to meet her. I am looking forward to continuing the conversations started on this trip. Being in Macau was particularly interesting given the combination of Chinese and Portuguese influences on the city. Whether on campus or elsewhere, most signs provide information in Chinese and Portuguese, and often English as well, as documented below. Minimum Qualifications: Ph.D. in Communication Studies or Performance Studies (or a closely related field) by date of appointment. Demonstrated potential for effective teaching at the undergraduate and graduate (M.A.) level; potential for an ongoing, successful record of scholarly research and publication commensurate with professional level; commitment to and/or expertise in educating a diverse student population. Desired/Preferred Qualifications: Demonstrated excellence in teaching at the university/college level. Experience in teaching courses in performance studies, including oral interpretation and storytelling, and intercultural communication. The ideal candidate will have experience with oral history, ethnography, or narrative and an emphasis in issues of diversity and culture. We also welcome applications from candidates with expertise in interpersonal/organizational contexts using quantitative social scientific methodologies, and with experience teaching courses in communication theory, research methods, and content courses relevant to those contexts. Duties: Teach undergraduate and graduate (M.A.) department courses within the areas of the candidate’s expertise. Participate in curriculum development; engage in a systematic program of scholarship resulting in conference presentations and publication; advise and direct students; provide service to department, college, university, and community. The Department of Communication Studies at California State University, Long Beach is committed to building a more diverse faculty, staff, and student body as it responds to the changing population and educational needs of California and the nation. We seek applicants and nominations from those who have experience teaching, mentoring, and developing research in ways that effectively address individuals from historically underrepresented backgrounds. California State University, Long Beach is an affirmative action/equal opportunity employer. Application Deadline: Position open until filled or recruitment cancelled. Review of applications to begin on November 15, 2012.